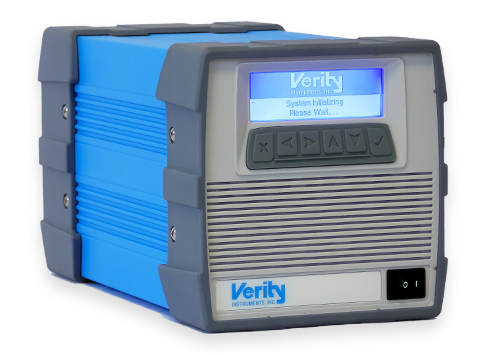 Unique in our industry, the SD1024XTM combines the functionality of a high performance spectrometer and process computer in the same size enclosure as Verity’s standard spectrometers. 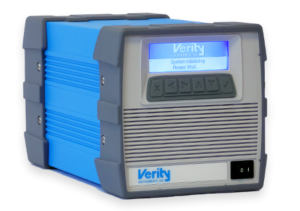 The SD1024X runs Verity’s SpectraView (version 6.2+) applications software. This is the same software as can be used with an applications computer in support of a traditional (SD1024D, SD1024F, and SD1024G series) spectrometer. The SD1024X spectrometer is designed for demanding semiconductor process control applications, such as low exposed area contact etch. 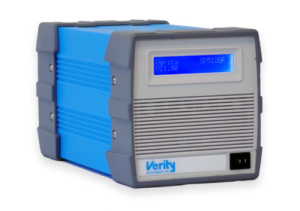 When coupled with a Verity flashlamp the SD1024X can also be used as a spectral reflectometer for film thickness or depth measurement. The scientific grade CCD features thermoelectric cooling (for low noise) excellent ultraviolet sensitivity, low noise, and wide dynamic range. The SD2048XH is similar to the SD1024X. However, it uses a 2048-element high performance CCD, the “H” high optical throughput optics, a narrower slit, and reports spectral data in 0.25 nm increments. The SD1024XH incorporates special high throughput optics and lower systematic noise as compared to the SD1024X. The optics used in the SD1024XH increase optical throughput by about 75%. The SD1024XH is recommended for applications that require maximum signal to noise, especially when measuring relatively low intensity signals (see performance data on next page). The SD1024XM is similar to the SD1024X. However, it uses a 2048 element mid-grade CCD. Since the CCD is 2 dimensional the SD1024XM can support multi-fiber applications. The SD2048XM is nearly identical to the SD1024XM, but reports spectral data in 0.25nm increments instead of 0.5nm readings as with the SD1024XM. Compared to the SD1024XM, the SD2048XM features a narrower inlet slit and modified embedded software parameters. Although the SD2048XM has better resolution than the SD1024XM, its sensitivity is significantly less. The SD1024XL uses a mid-grade CCD and was designed for general purpose semiconductor process applications. The SD2048XL is nearly identical to the SD1024XL, but reports spectral data in 0.25nm increments instead of 0.5nm increments, as with the SD1024X and SD1024XL. Although the SD2048XL has better resolution than the SD1024XL, its sensitivity is lower as a consequence of the smaller input slit that supports the higher resolution.